Do you find your skin suffering from the signs of aging? Fine lines, cobblestones, scarring, brown spots, and uneven pigmentation? If so, you may benefit from laser skin resurfacing. 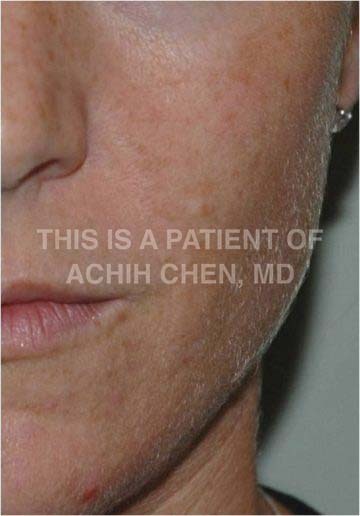 At the hands of experienced cosmetic facial plastic surgeon, Dr. Achih H. Chen, the latest advancements in laser technology can provide dramatic improvements to a wide range of conditions caused by years of sun damage, smoking, acne scarring, or simply aging over time. While tightening or lifting procedures such as necklifts, facelifts, or even mini-lifts, improve the sags and bulges of that “turkey waddle”, jowls and excess skin, there is no more effective procedure in the improvement of facial fine lines, crepe-like skin around the eyes, cobblestone-appearing skin, or hyperpigmentation (dark spots) than laser skin resurfacing. Laser skin resurfacing is designed to reduce the prominence of skin imperfections caused by aging, sun damage, and certain facial skin disorders. 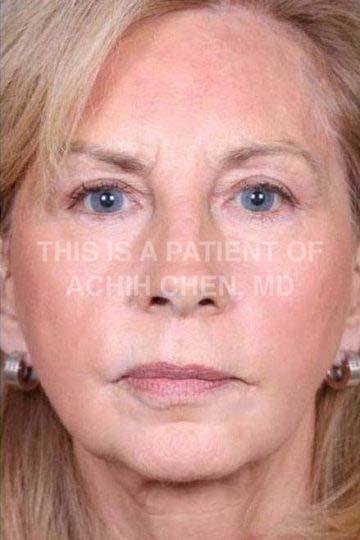 In the hands of our experienced facial plastic surgeon, Dr. Achih Chen, precisely applied laser energy can be used to remove the damaged outer layers of skin, exposing the healthier layers beneath. This is an extremely effective treatment for wrinkles, lines, facial scarring, freckles, and other skin conditions. Laser skin resurfacing treatment also stimulates the production of collagen fibers in the skin, which enhances the skin’s texture and elasticity. Additional collagen fibers tighten and tone the skin, making it appear healthier and more youthful. Laser resurfacing is customized for each individual to treat their skin concerns. For more minor skin blemishes such as dark or brown spots, only the very most out layer of skin is treated. This light or superficial laser treatment has a very quick healing time and is often called a “Weekend Laser Peel” or a “Microlaser Peel”. For skin conditions such as crepe-like skin around the lower eyelids, lines around the mouth, or cobblestone-appearance of the cheeks, a more complete laser treatment is required. This type of deeper treatment creates the most dramatic changes in the appearance of the skin and is often simply called “Laser Resurfacing or Full-Face Laser Resurfacing”. During your consultation, Dr. Chen will discuss your concerns with you and help you determine whether a “Weekend Laser Peel”, a “Full-Face Laser Resurfacing” or a treatment in between will best meet your goals. To schedule a consultation for laser skin resurfacing, contact us at the Georgia Center for Facial Plastic Surgery, serving patients from the Augusta and Evans, Georgia-area, as well as Aiken, South Carolina and beyond. Individuals can expect healthier, smoother, more vibrant skin and an immediate change in skin texture after a Microlaser Peel. * Most Microlaser Peel patients recover within a few days. * The actual length of healing time depends on the type of skin problem being treated and the depth of the laser treatment chosen to accomplish your goals. Dr. Achih H. Chen will help you choose the customized Microlaser Peel that is right for your aesthetic goals at your consultation. It’s often thought that a series of lighter laser peels, such as the Microlaser Peel or the Weekend Peel, will ultimately produce a result similar to the deeper treatment of the Full Face Laser Resurfacing. Intuitively, this seems to make sense. Repeating a series of lighter laser peels is similar to lightly sanding the imperfections off of a block of wood. Lightly sand the wood today and repeat every few weeks. In the end, the wood will be smooth, just as if it had been sanded vigorously in one setting. Using this same logic, using lighter laser peels or other lighter skin treatments like superficial chemical peels or the Spa-treatment, Microdermabrasion, repeated in a series will have all of the benefits of a more vigorous Full Face Laser Resurfacing without the recovery time. 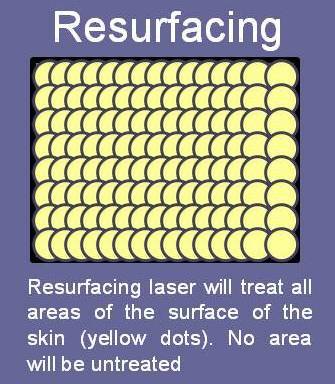 While this premise behind repeating lighter laser peels in a series seems to make sense, the problem is that the skin regenerates and heals between treatments. Because the skin keeps healing back between treatments, the same top layer of skin keeps getting removed. In the end, the last treatment in a series of light laser peels produces the same result as the first. This is very similar to mowing the grass in your yard. In the Fall, at the end of the grass-mowing season, you’re not any deeper in your yard at the last mowing as when you first mowed your yard in the Spring. Between each mowing, the grass grew back in place just like between each light laser peel, the skin grows back in place. 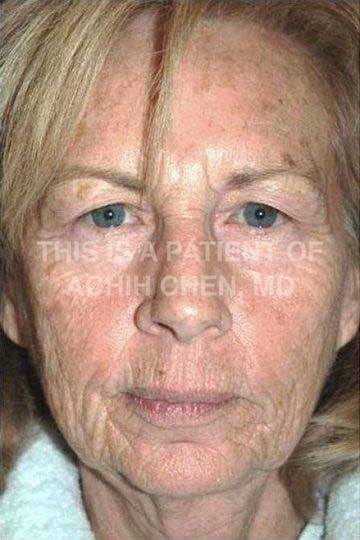 Consequently, lighter laser peels repeated in a series do not produce the result of the more vigorous Full Face Laser Resurfacing. 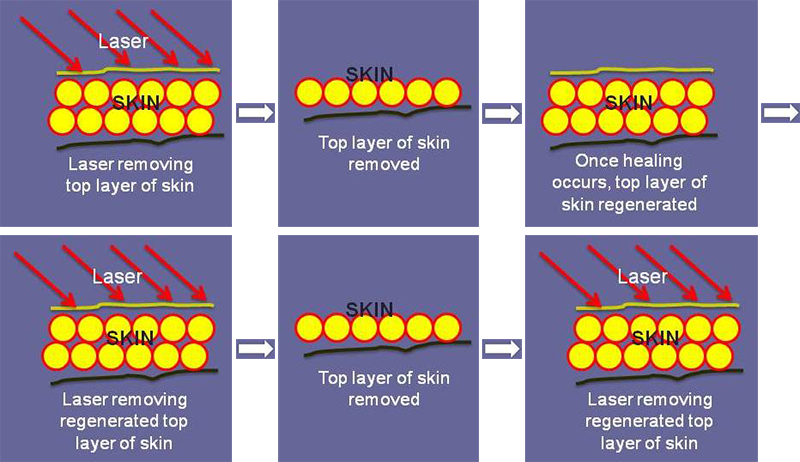 Repeated light laser peels do not have an additive result, instead, repeated light peels maintain the result created by the first peel. Ongoing advances in the technology of lasers have caused an explosion in the types of treatments available. As a result, there has been a considerable amount of confusion by patients and even physicians as to the appropriate type of laser required to achieve each individual’s goals. Despite the ever growing number of types of lasers available for aesthetic facial skin treatments, the technology used can be divided into two categories: ablative and non-ablative lasers. Ablative lasers work by removing the top layer of the skin to allow a fresh layer of skin to regenerate. The result can often be dramatic with smoothing of the fine lines, resolution of the pigment irregularities and improvement of acne scarring. Ablative lasers include the CO2 and the next generation, Erbium lasers. Ablative lasers are used for procedures such as the Full Face Laser Resurfacing or the Microlaser Peel. Non-ablative lasers do not remove the top layer of the skin, instead working by “stimulating collagen formation”. As a result, there is virtually no downtime, but the results are much less dramatic than with the Full Face Laser Resurfacing results produced by the ablative lasers. While the list of available non-ablative lasers continues to grow longer, they include the CoolTouch, SmoothBeam, Primos, N-Light, etc. Since the cosmetic results of non-ablative lasers are very different from that of ablative lasers, it is important for patient satisfaction to be well informed about the expected laser treatment results. MORE ON NON-ABLATIVE LASERS. Fractional Laser (Fraxel) vs. Laser Resurfacing, What is the difference? Fractional laser, for example Fraxel or Pixel, in an effort to have a short recovery, leaves areas of the skin untreated. Laser Resurfacing treats all areas of the skin. 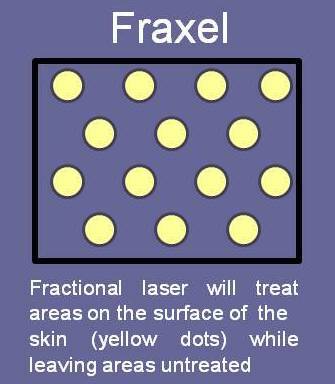 While multiple treatments of lighter laser peels doesn’t give a better and better result, fractional laser treatments (Fraxel) will give a better result with repeated treatments up to a certain point. The improvement with subsequent fractional laser treatments is due to areas that were previously missed or untreated are treated with follow-up treatments. The limiting factor is that once all of the areas become treated, there will no longer be substantial improvement. In short, once all of the areas on the skin have been treated, the laser cannot give any further improvement as it is treating the newly regenenerated skin (see above for a detailed discussion on this topic). 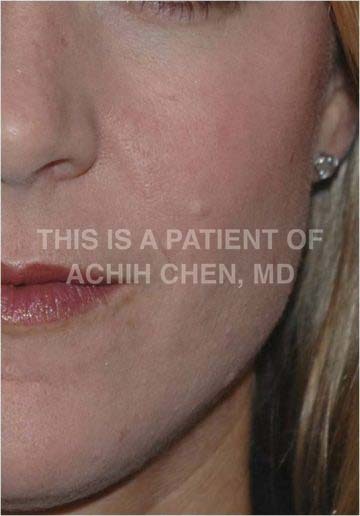 If you are considering laser treatment, or deciding between Laser Skin Resurfacing or a Microlaser peel, do not hesitate to contact The Georgia Center to schedule an appointment with our facial plastic surgeon, Dr. Achih H. Chen. We serve patients from Evans and Augusta, Georgia, as well as patients visiting from Atlanta, Aiken, South Carolina, and beyond. Also, if you desire a more complete facial makeover, Laser Skin Resurfacing can be combined with Botox injections, Restylane, and more for a total cosmetic enhancement.